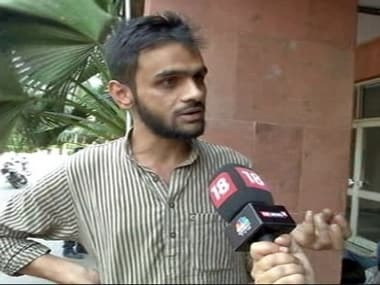 New Delhi: Two men, who had claimed responsibility for the attack on Jawaharlal Nehru University (JNU) student leader Umar Khalid, have been detained, police said on Monday. Darwesh Shahpur and Naveen Dalal are currently being interrogated, they added. A team of the Delhi Police's Special Cell had visited the village of Sikh revolutionary Kartar Singh Sarabha where the two had said they would surrender on 17 August but they did not turn up. In a video uploaded on Facebook on 15 August, they claimed the attack on Khalid was supposed to be an "Independence Day gift" to the citizens. The police are verifying the authenticity of the video and trying to trace the IP address from where it was uploaded. Khalid was attacked on 13 August when he was on his way to take part in an event at the Constitution Club here. He, however, escaped unhurt. On Tuesday, the Delhi Police handed over the case to its Special Cell, which incidentally is already probing a sedition case against Khalid and two other JNU students. The police had also said that they were not "intimated" about Monday's event attended by Khalid. A police officer, privy to the probe, said the police had seized the weapon used in the crime and preliminary forensic examination suggested that the pistol had jammed when it was used against Khalid. He said they were yet to ascertain whether shots were fired as no empty cartridges were found at the spot. A case of attempt to murder was registered by the police in the incident.